Remove a Hornet’s Nest the Right Way - Yes Pest Pros, Inc. Remove a Hornet’s Nest the Right Way - Yes Pest Pros, Inc. 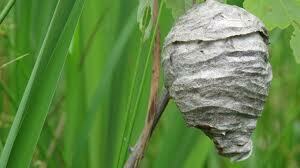 There are few threats posed by Mother Nature that can mysteriously appear in your back yard quite like a hornet’s nest. Unlike the virtuous honeybee, the hornet has no intention of making anything sweet to eat. They tend to have a very bad disposition and can pose a real health threat to pets, kids and adults. Some people feel that they can remove a hornet’s nest on their own. You can always try but it is probably a better idea to call Young Environmental Solutions and have a professional take care of it for you. They’re the residential and commercial pest control experts, but if you insist on doing it yourself, follow these tips. The key to properly outfitting yourself for hornet nest removalis to cover every inch of your exposed skin as possible. This includes the top of your head, your eyes and preferably your face, your hands, arms, torso, legs and feet. A bee-keepers hat is ideal, but since most folks don’t have one lying around, anything with a face shield will work. Also, don’t bundle up to the point where you can’t control your arms and hands. You’ll need all of your dexterity. If your pest control weapon is hornet spray, you’ll want to approach the nest very carefully. Begin spraying the hornets from the top of the nest, down, not from the bottom of the nest where the entry hole is often located, failure to do so will likely cause a steady stream of hornets to cascade down on your head. If your spray has a plastic extension nozzle, use it. Anything that keeps these flying pests away from you is a good thing. Of course, the easiest thing to do is to call your Granger pest control experts at Young Environmental Solutions to take care of everything. One final tip: be sure to attack the nest at night when all of the drones and the queen are home and in chill out mode. If you attack the nest during daylight hours, you risk many of the residents being out and about. They’ll simply come back and start building a new home. Use diffuse, indirect light to work by, as well. Direct light tends to anger an already aggressive species. Shine your light above or to the side of the nest. The last thing you want is a prolonged confrontation with hornets. If you get into trouble or think this job is too much, contact Young Environmental Solutions to come out and remove of the hornets nest right away, because you don’t want it around any longer than it has to be.